Click on BIRTH sign and read about those early years. This is where 'it is widely accepted' to have started in Australia. Maitland Show Ground, NSW and this is the site of the original Grandstand as it was when photographed in 2003. 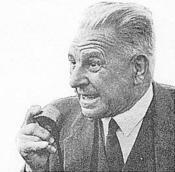 Read the story, written by Johnnie Hoskins himself of how he ended up at West Maitland in 1923 and how his first meeting came about. The rest is history. Click on red heading. 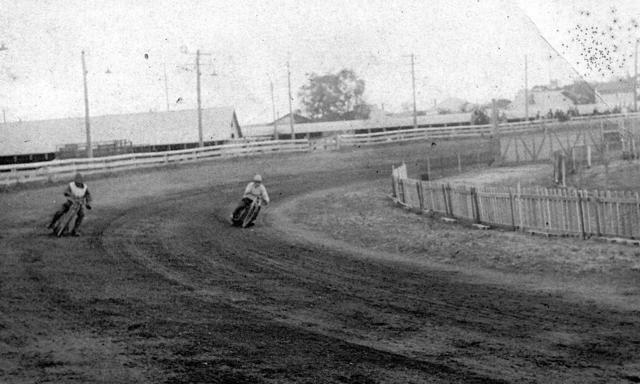 His story of Speedway ( at Maitland) from the very first day, by John S. himself. Maitland Show Ground. The big 1/2 miler on the left just about follows the original outline of the track used in 1923. The smaller track on the right is training track for trotters. 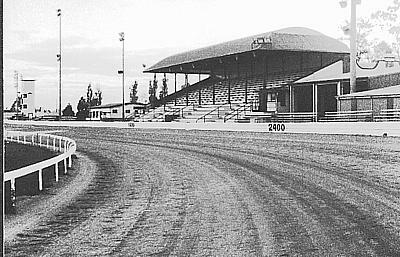 The Johnnie Hoskins Trophy Speedway meeting was reintroduced on this small track in Dec. 1996. Lionel Hoskins came out from England to present the trophy. 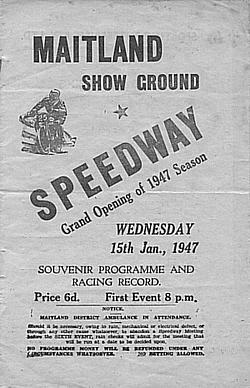 THE FIRST EVER 'SPEEDWAY' PROGRAMME at Maitland. YES it was Motor Cycle Racing on grass ! Heat 1. over 2 miles. 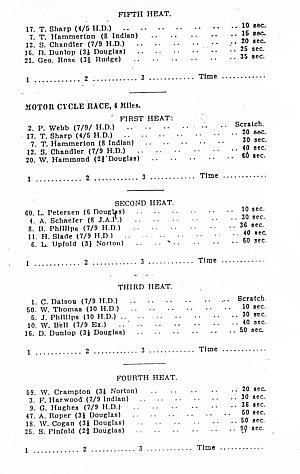 W.Crampton on a 3 1/2 HP Norton.by 10 seconds to C.Datson on a Harley 7/ 9 HP, by 45 seconds to S.Pinfold on a 2 3/4 HP Douglas. in a time of 3min 37 secs. That was an average speed for the two miles of 33. 2 MPH or 53. 1 KPH. A HUGE "Thank You" to Brian Lear for the scan of this historic programme and information. 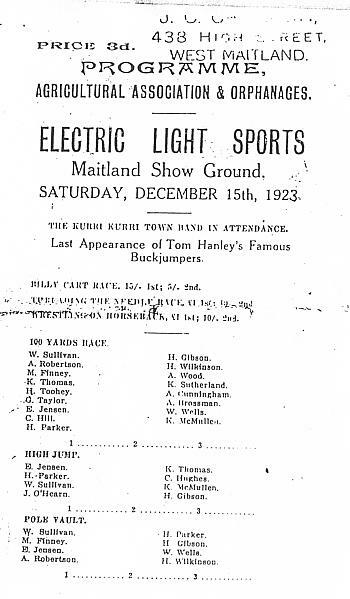 The advertisement in the Maitland Mercury newspaper on the 15.12.1923 promoting what was to be the first 'Speedway' meeting. The Mercury is still operating in 2003. 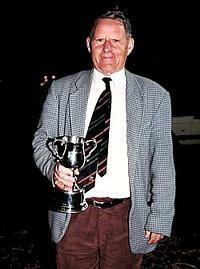 One of John S' sons, Lionel Hoskins with the Johnny Hoskins 1996 trophy. Won by Tony Rose of Qld. Click on the sign to read the story. 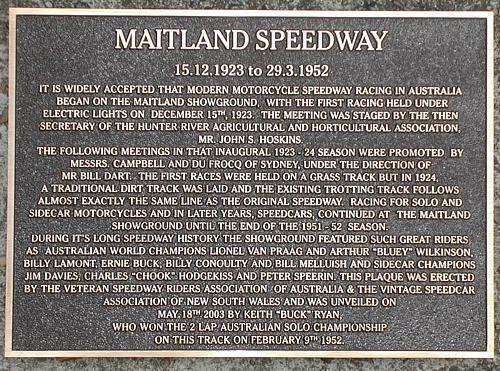 The Maitland commemorative plaque. Words and research by noted Historian Mr Jim Shepherd. 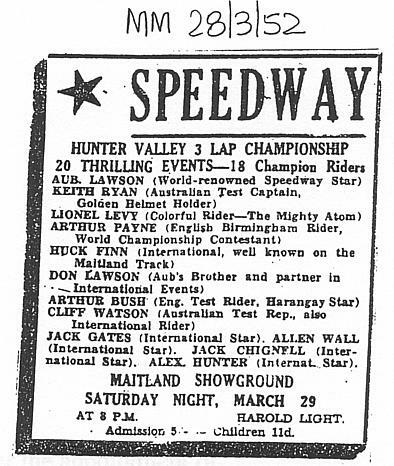 An add from the Maitland Mercury newspaper, 5.4.1950, advertising the appearanace of Frank "Satan" Brewer the American Speedcar ace. 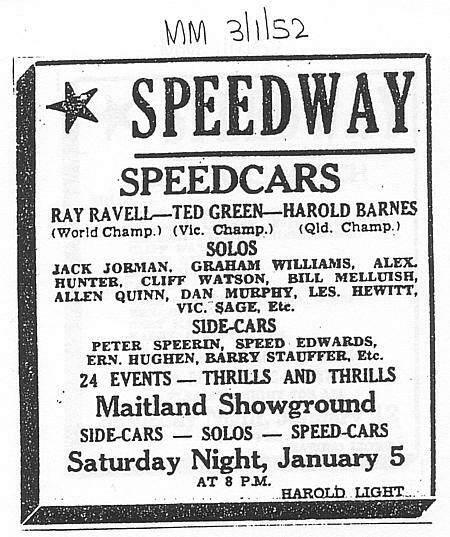 3.1.1952 an advertisement for what was to be the last ever Speedcar programme at Maitland Showground. 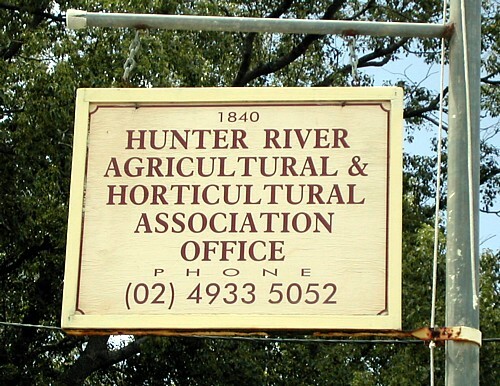 I get a lot of 'pickers' and criticism about this page and the West Maitland history. 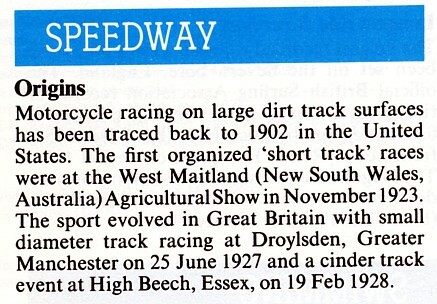 See the Guinness Book of Records ( 1986) statement at foot of this page for their official statement of the origins of dirt track Speedway in Australia. I also don't think anybody really thinks Johnnie Hoskins 'INVENTED' Speedway. (I have added the results to the above programme 'digitally'. An early Agricultural Show at Maitland Show Ground. 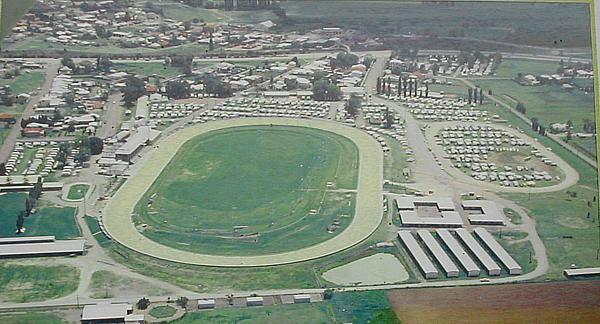 This is what I believe to be one of the earliest photos of Maitland Show Ground 'Speedway' track. Note the pole line of grass which confirms the actual original track was grass, also the inner dog racing track, still there in later years. Thank you to International Speedway rider and friend the late Lionel Benson for this photo. 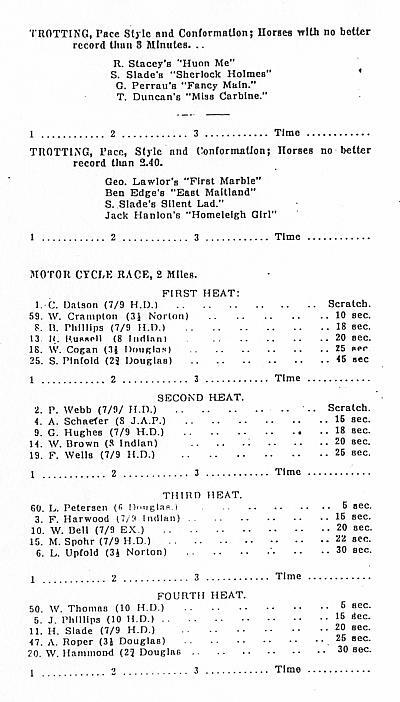 Click on Bill's name to read his first hand account of that first meeting in 1923 - from the man who won the first race. 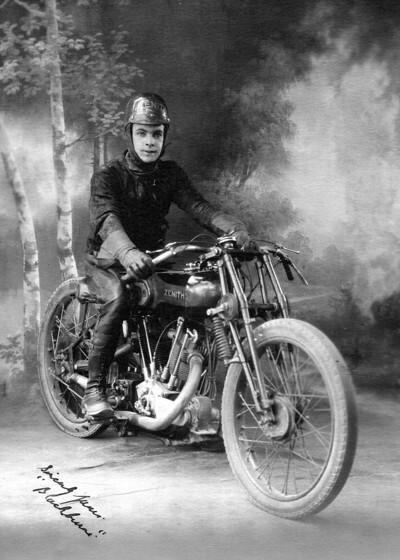 Alan Whitfield Roper - who rode at that first meeting in December 1923. He also rode under the name of Alan Blackburne ( his Chater-Lea bike had a Blackburne engine ) so his family didn't find out he was riding. A lot of the young riders did this. Thank you very much for this great photo from Alan's Grandson Luke Roper.